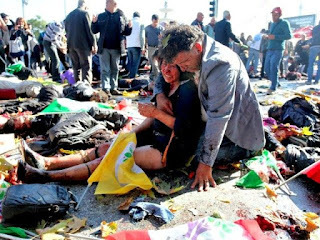 Before we enter the Candidate Forum today, yours truly would like to take minute and talk about the terrorist attack in Ankara, Turkey and Brussels, Belgium. It seems that there is no end to the senseless acts of terrorism being perpetrated around the world. Whether it is in a market place in Ankara or the airport and subway station in Brussels, it seems that no place is safe. There seems to be no shortage of people willing to commit blow themselves up for what, who knows why. Actually, the reasons why are very clear to those who commit these acts but for the rest us, we are left wondering how and why. This being a Presidential election cycle, already candidates on both sides of the aisle have offered their prescriptions-everything from "securing Muslim communities" to strengthening American resolve to destroy the perpetrators. Terrorism is an important but complex subject that cannot be addressed with simple pronouncements. The fight against terrorism requires a multi-pronged solution. Of course, that is of little comfort to the victims and their families. Right now, the only thing we can do is offer comfort and our prayers. Let us hope that one day we do not have to look over our shoulders or live in fear. One day we will all live in peace.